Beautiful baptismal set with scooter theme for your little boy. In shades of gray, it gives finesse to your baptism. On the candle that is adorned with a large fabric bow made of white, gray and gray striped fabric are tied with beautiful ribbons of black scooters. And the bottle of oil has the same thing on it and the towels are embroidered with the same cute scooter. The big suitcase bag is striped gray-white and is embellished with the bosom of the theme of baptism. The set includes: a candle, a large suitcase, three candles, a soap, a bottle of oil, laurels, underwears and towels. 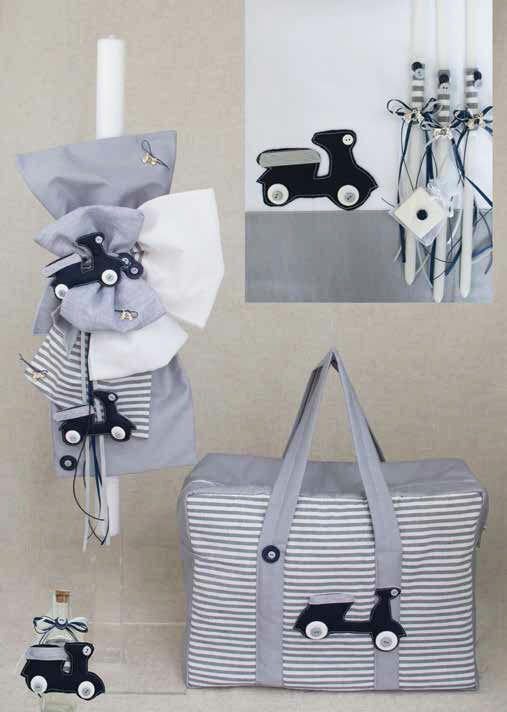 https://www.preciousandpretty.com/2018/07/greek-christening-set-with-cute-scooter.html Greek Wedding Favors|Orthodox Crowns|Stefana|Baptism Invitations Greek Christening set with cute scooter E808 Christening set for boys, with cute scooter on, in gray and white colors. Product #: Greek Wedding Favors|Orthodox Crowns|Stefana|Baptism Invitations_1501656399246687678 5 stars out of 5 reviews.